The Danish company Oticon designs and manufactures hearing solutions for adults and specialized paediatric instruments. Oticon´s hearing solutions are complex High-Tech products featuring groundbreaking audiological concepts. As these products need to fit comfortably and effectively in a human ear, they need to be assembled of extremely small and particularly detailed parts. ESCUBEDO is a Spanish company with more than 40 years' experience making electric connectors for the more competitive industrial sectors like automotive or electric appliances. Currently, ESCUBEDO exports their production to more than 45 countries through an extended Network of industrial subsidiaries and commercial delegations in Europe, America and Asia. Best material, machinery, control instruments or informatic programmes, like Fikus Visualcam, are decisives to reduce development and production costs. Schuchard & Pollmeier GmbH is a specialist in the Wire EDM technology serving other companies that need a high-performance and reliable partner. 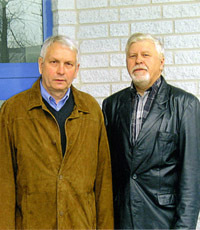 It is not therefore a surprise that the company chosed and has been using Fikus Visualcam since 2004. The company is now known as a reliable partner in metal processing and serves satisfied customers at home and abroad. The core business comprises EDM since the foundation and since 1998 surface grinding as well. 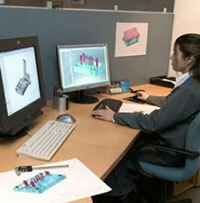 They produce molds, dies and extrusion parts for the Plastic, Automobile and Aircraft industries. Rezmin Tool and Die, a Canadian specialist in progressive dies for the automotive industry, has been challenged by low-cost competition from overseas. 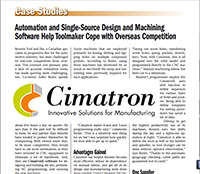 Using the new CNC machines and the software from Cimatron, Rezmin has been able to stop outsourcing die sets. It produces them eficiently in-house at cost savings up to 50%. Talleres Cridi S.L. is a Spanish company, that provides services along the complete manufacturing process chain, including product design, rapid prototyping, tool design and highprecision manufacturing, quality control and the assembly of parts. Founded 25 years in the Barcelona area, the company has meanwhile prestigious customers in the automotive and aerospace industry, the packaging industry as well as in the healthcare and pharmaceutical industry.